Measuring devices being installed on a cargo ship will provide oceanographers with vital data on the oceans’ ability to slow the build-up of carbon dioxide in the atmosphere as part of a major new collaboration between industry and the National Oceanography Centre (NOC). The cargo ship belongs to the China Navigation Company (CNCo) who are partly funding this project. Scientists from the NOC, will work with CNCo using its multi-purpose vessel, MV Shengking to record changing patterns in the flow of carbon dioxide between the air and oceanic surface waters. The data will be sent immediately to the scientists via satellite. The oceans play a major role in reducing the rate at which the planet is warmed, by absorbing carbon dioxide from the air. There is also evidence that as the oceans absorb more carbon dioxide they become more acidic – threatening the health of calcareous ecosystems like coral reefs. It is therefore essential to know where and how carbon dioxide is entering and changing the oceans. 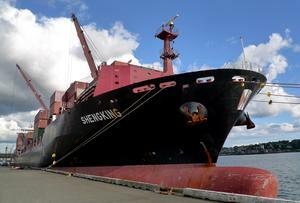 The route of the MV Shengking takes the ship across the Pacific Ocean from Canada to Australia. It will link up with the Institute of Ocean Sciences (IOS), Canada and the Commonwealth Scientific and Industrial Research Organisation (CSIRO) in Australia for sample analysis and technical support when the ship is in port. A team of people from NOC and Campbell Ocean Data will install the equipment on board in Vancouver this month. The instruments and electronic systems are designed to be exceptionally sensitive yet require minimum maintenance. They also need to be robust enough to survive life in seawater and extreme temperatures and humidity. A water circuit will be installed on the ship in parallel to the ship’s cooling water unit. As the water flows through a special tank, carbon dioxide will be measured along with dissolved oxygen, temperature, chlorophyll, turbidity and the salinity of the sampled water. The data are recorded in the engine room along with the ship’s GPS position and atmospheric data collected from instruments on board. The record is then transmitted to the National Oceanography Centre, where it will be checked and transferred to a live web page and made available to the global scientific community.